Hello everyone, today we are cleaning the chrome while we rehabilitate an aged and neglected vintage sewing machine. Adding function and fashion, the chrome or nickel plating often serves two distinctly different purposes. We will discuss a little about the function and the fashion aspects of the plating. Then we will be diving into how to clean, polish and rehabilitate it when it has been neglected and rusted over time. 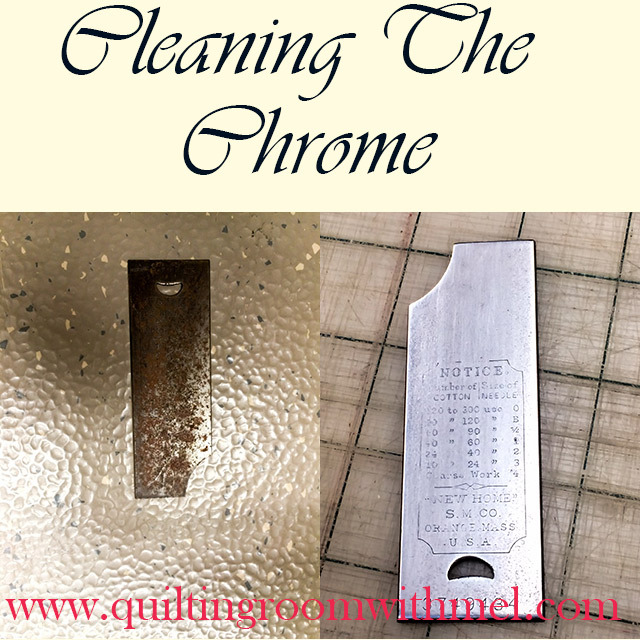 As we discuss how to handle the inherent problems with chrome and nickel plating we will also talk a little about the functional ability of chrome. For all intent and purposes as far as the sewing machine there is not much difference between the two and for the ease of conversation it will be referred to as chrome. Cleaning and polishing rusty chrome really depends upon the damage it has undergone and the quality of the initial chrome plating surface. Good thick chrome plating can withstand a harsher environment better than a thin layer. Chrome generally doesn’t rust. It is the base metal that the plating is on that rusts and it shows up on the surface of the chrome through tiny flaws in the chrome plating. If this situation is left alone long enough the base metal will be eaten away by rust and the chrome disintegrates in tiny flakes or it will peel off the base metal in razor sharp strips. If caught early enough the tiny flaws can be cleaned and polished before they are actual pits in the base metal. The flaws can be microscopic and the chrome will take on a rusty appearance. This would be the type of damage that can be polished to the point that the chrome appears like new to the naked eye. With occasional waxing, the shine will last indefinitely. When we are cleaning up the chrome pieces on a new to us machine we remove the pieces from the machine. This lets us handle the pieces easier and it also lets us assess the extent of the rust and from there we can determine what cleaning route we need to take. Our first step is to wash the surface with a good degreaser and a soft scrubby pad. Sometimes its alcohol and at other times I use Dawn dish soap to remove all the organic dirt and grime from the chrome. For some of the pieces, this will be all the cleaning they need. If they need more cleaning of if there is a lot of small detail to be brought back then my favorite chemical cleaner is Evapo-Rust. We get it at one of our local auto parts stores by the quart can. We pour some of it into a bowl that our parts will fit in with just enough to cover the pieces and leave it setting for a couple hours or so. If it doesn’t come out clean after a couple hours then we brush it a bit with a nylon brush (toothbrush) and drop it back in and leave it until it does come out clean. It does a fantastic job or getting to the bottom of the pits and flaws and eliminating the rust at its source. When we are done using the Evapo-Rust the cool thing is it can be poured back into the can and used over and over several times. If you don’t like the idea of mixing the used with the fresh then it can be sealed in any type container you have and still be ready for the next time. Once you have cleaned the pieces sometimes they may appear to be cloudy or foggy looking. This is generally caused by wear and can usually be cleared up with a very fine polishing compound and a lot of elbow grease. OR you can use the same compound with a buffing wheel or a buffer attachment on a Dremel tool. Some people will use a jewels wheel and jewelers rouge to polish with. I will generally use chrome polish and elbow grease. Again found at the local auto parts store. I am not a brand specific type person so sometimes I will use something like Maguires chrome polish or Mothers chrome and mag wheel polish. But I have also had great results with household products like Brasso. Whatever you choose to use remember at this stage it is just chrome and all chrome is cleaned the same way whether it a car, motorcycle or sewing machine it all cleans the same way. Now there is another technique that I have had moderate success with. It takes a lot more elbow grease, some 0000 or finer steel wool and the last stage of polishing is simply water and aluminum foil. Once the chrome is cleaned and polished with the steel wool then it is rubbed down with aluminum foil and water. It works surprisingly well and is really not as labor intensive as it sounds. I have not used this technique extensively and therefore I cannot in good conscience pass any judgment on it. I have used it occasionally and was pleased with the results. I did seem to have better luck using the thinnest cheapest aluminum foil I could find. The heavy duty thick foil did not do as well for me. I also would not recommend it for anything with small details because I don’t feel like it is supple enough to follow the fine edges of the detail. On the other hand, it did a great job on smooth surfaces regardless of whether it was flat, convex or concave. I wanted to bring attention to the technique because it also enforces the concept that there is more than one way achieve results and the technique that works for me may not be the same technique that works for you. At the end of the day regardless of the technique, it’s the personal satisfaction with the end result that counts. While Evapo-Rust is probably one of the safest rust removers available it still has its limitations. The only down fall I have personally experienced is totally by my own doing and lack of thought. No it isn’t caustic and didn’t cause any reactions when it has gotten on my skin. But it is always recommended to follow the manufacturer’s directions when using any products. What I did become reminded of while using it is simple. The process used to darken raw metal known as – Bluing - such as on gun barrels or black-side Singer sewing machines for instance, is a controlled rusting process. I soaked a rusty presser foot in Evapo-Rust without thinking and it did a marvelous job of removing the rust and the blu-black finish from the foot. No real damage was done but thinking about it I felt I needed to warn any of you who might be considering trying it to use caution around any black chrome, Bluing or even old black powder era firearms using the traditional metal finish known as browning. Evapo-Rust does a wonderful job of stripping the darkened finish away from the metal. So use it with care and confidence. Until next time enjoy your machines your way and may they always bring you peace of mind and joy of heart. If you missed any of the other posts in this series be sure to check out the entire resurrecting vintage sewing machines series. You may also enjoy our other sewing machine posts as well. Don't forget to sign up for our newsletter to get vintage sewing machine information delivered to your inbox each week and a checklist to help you troubleshoot.